The next big thing in my needlework life was the discovery of British needlework magazines. In particular, I became a big fan of New Stitches. I was browsing in a bookstore in Dallas during a visit in c. 1993 and came across NS and saw the design of Anne Boleyn (I was already long down the Tudor path at that point) and of course I had to buy it. I was also intrigued by the blackwork design, which was a technique that I was unfamiliar with up to that point. While I was up there I bought some 22 ct. fabric and two thicknesses of thread and began to stitch. 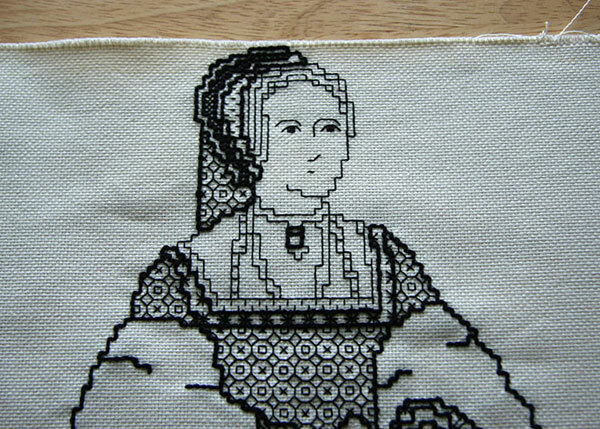 Unfortunately, I completely screwed up the starting place and by the time I started to get to the top, I realized that Anne was about to end up "historically accurate" without a head. As you can see above, I did actually managed to squeeze in the top of her French hood on the very tip top of the fabric. I actually plan to do this design again someday (and start in the right place, and probably on a different type of fabric) although I've been keeping the "mistake" version around for some reason. I guess as a reminder to "measure twice, start stitching once". Lara: I can see Anne applied to a lovely black velvet pillow top with outrageous tassels. I would hate to waste your beautiful stitching. Howdy Linn, thanks for your kind words. For now, nearly-headless Anne is in the basket with a lot of other projects that need to be finished (and which I need to post pictures of). I like the pillow idea... If I ever get around to doing something with it, I'll be sure to post a picture!